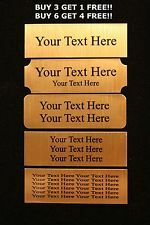 Brass Metal Plates for engravers. Perfect for Trophies, Corporate Awards, Name Plates, Picture Frames. Perfect for individuals or engravers to purchase the product on Trade. Various sizes. Please call 905-946-8550 and ask for Jerry.